Outstanding video picture and sound reproduction with low error rate. Designed exclusively for DVC camcorders, Fujifilm's Mini DV Cassette is the ideal tape for a wide range of high-end video applications, including editing. Its compact design and exceptional performance qualifies it to be the ultimate choice in digital video. 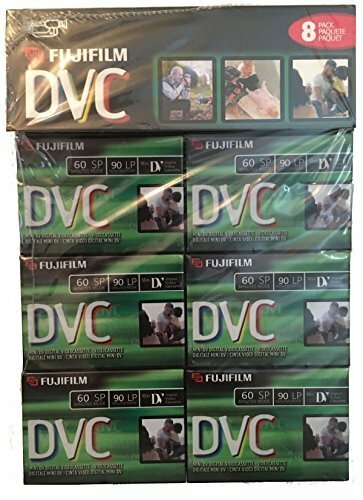 Fujifilm DVC digital videocassettes maximize the performance of MiniDV camcorder systems. They are ideal for low-cost ENG/EFP applications, small format documentaries, and special event videos. Fujifilm DVC digital videocassettes deliver superior sound and image quality, yet are durable enough to stand up to the rigors of repeated recording and playback. Manufacturer: Fuji Photo Film Co, LTD. Publisher: Fuji Photo Film Co, LTD. Studio: Fuji Photo Film Co, LTD.